Enter your information below if you would like your child to be considered as a Little Saver of the Game! 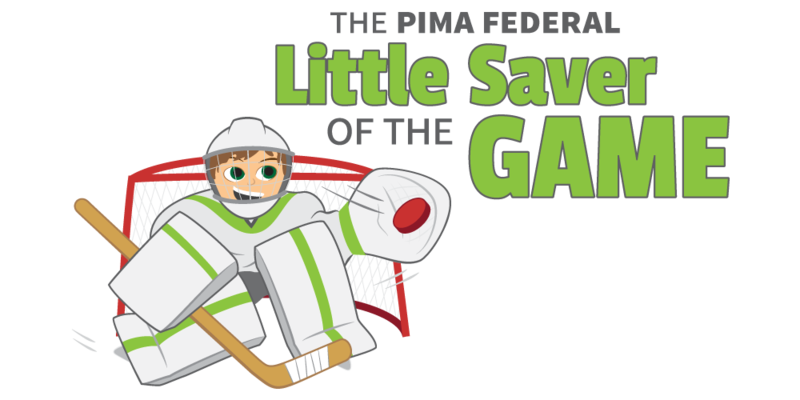 The Pima Federal Little Saver of the Game is in partnership with the Tucson Roadrunners. Pima Federal youth saving account holders are eligible to participate as a Little Saver of the Game. Youth savings account must be open and in good standing at the time of submission. The submission form is an interest to participate and all submissions will be reviewed by Pima Federal and selected by random drawing. If your child is selected to participate Pima Federal will contact you within 2 weeks prior to your assigned game. Pima Federal will deposit $2 ($1 from Tucson Roadrunners, $1 from Pima Federal) in the youth savings account for every save made by the Tucson Roadrunners goalie at the home game that they are selected as Little Saver of the Game. The total amount for all Roadrunner saves made will be deposited within one month of the game each little saver was selected for. Each youth account member may only be a Little Saver of the Game one time during the 2018-19 season.